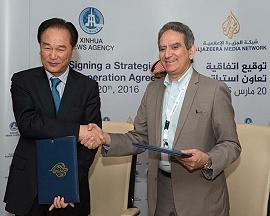 Xinhua news agency and Al Jazeera Media Network sign co-operation deal. Doha, March 2016: Xinhua News Agency President Cai Mingzhao has signed a bilateral agreement of strategic cooperation with the director-general of Al Jazeera Media Network in Doha ahead of the World Media Summit (WMS) 2016. According to the agreement, the two organizations will expand their cooperation in areas of news information cooperation, personnel exchange and training, the WMS, and news coverage support. Under the theme of "The Future of News and News Organizations," the WMS 2016 gathers around 350 delegates from global media in the Qatari capital of Doha for the coming two days to discuss media development and cooperation. Before inking the deal, Cai told the Al Jazeera leader, Mostefa Souag, "Xinhua appreciates the efforts Al Jazeera has taken to host the summit and attaches great importance to the relations between the two news organizations." "Global media is facing both common challenges and common opportunities ... I hope the WMS platform can promote the media development and the win-win cooperation," Cai said. Souag said Al Jazeera is glad to organize the summit and receive the media leaders in Doha. "Al Jazeera will always open the door to Chinese media leaders, to learn from them and to help boost the global media cooperation," he added.